We don’t get sent vinyl records very often anymore, so I always treat them with a certain degree of preference. In the case of Michael Intergalaxon, the gorgeous cover artwork raised my curiosity instantly, and while I was too lazy to get a record player, I was lucky enough that there was a free digital copy available on the label’s Bandcamp page. According to the info sheet, Michael Intergalaxon is an alien visiting Earth in order to find the perfect birth specimens. In real life, he seems to be a Swede (quite certain of that) and an ornithologist (not verified) who plays some of the craziest and crankiest breakcore that I have ever come across. The 20+ songs of the release - and yes, the vinyl edition comes with three bonus tracks not available on the digital release - average a playing time of a little over a minute, and in that time Michael proves that he is in desperate need of Ritalin. Rarely have I come across a half hour record containing so many different ideas and musical styles. There is everything, from neck breaking techno to growling grind core, with elements of disco, J-pop, 8-bit electronica, funk, wave, lounge, free jazz and especially folklore from all over the world: Scandinavia, Balkan, North Korea,... you name it! Of course the concept of the music never allows the artist to elaborate on a single idea, and while this should frustrate the average listener, this is also quite intended. 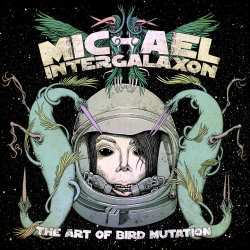 The Art Of Bird Mutation is thus a rather unique album, but allow me to still come up with some comparisons that might make it easier for you to classify the sonic eruptions. John Zorn’s early Naked City, Mike Patton’s solo body of work and Jason Forrest’s approach to plunderphonics all came to my mind, although Michael Intergalaxon makes sure to be totally himself. While the cornerstones of the music are electronic breakcore and rawest grindcore, the countless different spices make this LP a really hard to label affair. You might not want to listen to this before going to sleep, because it has the effect of a really potent energy drink, but as a novelty item, it certainly has a lot of appeal. The production is perfect and the artist is never running out of ideas. I even dare say that this record has more of them than many artists come up in an entire lifetime. The more adventurous listeners among you will be delighted (there is even a Michael Jackson sample early on), and everybody should also give this guy a chance, just to see what is possible nowadays in the world of music making.